Having had the opportunity to grow up in Hamtramck during the 50s and 60s is something I will cherish for the rest of my life. I cannot begin to describe the joy and freedom I shared with all my friends and relatives during that memorable time when the city was in its heyday. This period has been described by many others and I shall not attempt to emulate. While attending St. Florian Parochial school I had the honor and privilege of serving as an altar boy. This gave me a unique opportunity to experience the planning and preparation which was part of every ceremony as well as to meet the priests on a more personal level. In addition I was able to attend several baptisms, weddings, funerals, etc. while having access to a front row seat for all major religious holidays which were standing room only. During that period Fr. Walkowiak was pastor with five associate priests, Frs. Zielinski, Strzelewicz, Oleksyk, Skalski and Krajewski. I could write a book of my memories as an acolyte but would like to focus on funerals for this article. I will explain why shortly. Usually the celebrating priest and servers would begin the ceremony by visiting the funeral parlor, or the deceased’s home for prayer and blessing prior to closing of the casket. Weather permitting we would simply walk to the funeral homes which were located within walking distance. This was followed by transporting the casket to the church. A funeral mass in those days always began with the priest, servers and family participating in a procession from the front doors of the church to the altar. The catafalque was placed in front of the altar during the service and covered in a black cloth. After mass the funeral party walked back to the vestibule where a Funeral Director waited to organize the funeral procession. A church bell rang slowly and repeatedly during this period. I was told years later by a former associate priest that Fr. Walkowiak requested the officiating priest and servers be transported to the cemetery in a limousine. I must say I had no objection. In the limousine there was a driver and in the front passenger seat the Funeral Director. I can recall Messrs. Leo J. Miller, Orlikowski, and Kaczarowski. Their establishments were in close proximity to the Parish. Everyone was dressed in a black suit, white shirt and black tie. The majority of burials were at Mt. Olivet Cemetery. The usual processional route was Holbrook to Buffalo then north to Caniff, east on Caniff to Mound Rd. north on Mound to McNichols and east to the cemetery. During the slow procession to the cemetery there was small talk between the Funeral Director and officiating priest. Two altar boys were in the back seat with the priest to be seen but not heard. Once at the burial site everyone would disembark and a final rite of burial was performed at the grave beneath a tent. This was always concluded by singing “Witaj Krolowo Nieba” in Polish, (“Hail Queen of Heaven”). For me this was the most unpleasant aspect of the entire burial ritual. It always induced profound sorrow in the form of uncontrollable crying and wailing, both male and female. Fathers Walkowiak and Strzelewicz with their deep baritone chanting, a capella, evoked the greatest response. I can recall a particular funeral when the widow was so distraught she threw herself onto her husband’s casket and being on rollers it lunged forward. She nearly fell into the grave head first. Now for the crux of this story: While perusing through the Golden Jubilee Anniversary book of St. Florian Parish, I happened upon a page which listed Parish firsts, such as first wedding, baptism, funeral, etc. I noticed that the first funeral was held for Frank Engler, who was buried at Mt. Olivet Cemetery on January 13, 1909. This was at the first St. Florian Church organized in 1907 by Fr. Zmijewski. Ground was broken for the church in March 1908 and the corner stone laid that same year. The present edifice was built a few years later. The first church was dedicated on January 10, 1909 by Rev. John Foley, Bishop of Detroit. This is the day Frank Engler died. During a routine visit to Mt. Olivet a few years ago I decided to visit Frank’s grave. At the cemetery office I was informed Frank is buried in Section 7, Tier 15, Grave 63. After spending the better part of an afternoon searching, I was unable to locate the grave. Returning to the office and telling them of my dilemma I was told that an employee will find the grave, mark it with a pink ribbon and at that time contact me. In the meantime, I attempted to obtain a bit of information on Frank and his family. After contacting the State of Michigan I was able to procure a copy of Frank’s Death Certificate. Frank Engler was born in Hamtramck on July 6, 1903 the son of Wiktor and Marianna Engler, both of whom were born in Germany. They lived at 1902 St. Aubin in the Village of Hamtramck. He was cared for at home for three days by Dr. X. A. Jones whose office was located at 1853 Jos. Campau. Dr. Jones pronounced him dead, in his home, at 1 p.m. on Sunday, January 10, 1909 at the age of 5 years, 6 months and 5 days. The cause of death was pneumonia. He was buried three days later. I cannot decipher the name of the Undertaker on the Death Certificate, however, his address was 1133 Chene St. Wiktor and Marianna Engler, his parents, are listed in the Golden Jubilee Book under deceased members. A short time later I received a call from Mt. Olivet informing me that Frank’s grave had been located. When I returned I discovered the reason I was unable to find it. The grave was unmarked! As I stood there thinking about Frank’s funeral and my prior experiences as an altar boy, I could not help but wonder … who was there on that cold January day? Was it snowing? What did Fr. Zmijewski have to say in his eulogy? Was it in German or Polish? Did they sing “WitajKrolowoNieba”? How was the funeral party transported to and from the cemetery? After giving it some thought I decided Frank should have a headstone given his role in the history of the Parish. I contacted the Piast Institute and they put me in touch with David Krot of Krot Funeral Home in Hamtramck. With his help I was able to purchase a headstone and have it appropriately engraved and placed, lest Frank’s role as the first person buried from what was to become the largest Polish Roman Catholic Parish in Metro Detroit be forgotten. Frank is buried in one of the oldest sections of the cemetery just east of the Grand Trunk railroad, which was used to shuttle visitors to and from the cemetery early on. Section 7 is devoted solely to children. The majority of graves are unmarked. Those with headstones have been there for more than a century and need to be trimmed, raised and cleaned. The section contains children of Polish, Italian, Russian, German, Slovak and many other ethnicities. Another interesting fact is that immediately east of section 7 there is a plot of land all of which is unmarked. This section is devoted to stillborn children. I wonder how many of our aunts, uncles and cousins lie there known only to God? Mt. Olivet is a treasure trove of ethnic Detroit history having opened in 1888. The cemetery contains approximately 340,000 graves including, among many others, that of Tom Tyler (Vincent Markowski), a Polish actor who portrayed “Captain Marvel” and “The Phantom” in the 1930s and 1940s. Tom was born in Pennsylvania but grew up on Mitchell between Holbrook and Evaline as did my mother who knew him personally. For anyone who may want to learn more about the history of Mt. Olivet Cemetery a book has been written by Cecile Wendt Jensena, a world-renowned Polish genealogist. The book is entitled “Detroit’s Mount Olivet Cemetery.” It can be purchased at the Polish Art Center in Hamtramck or on line. If you decide to take a tour of the cemetery or just to visit a loved one, please stop by to see Frank. Graduated from ST. Florian parochial school in June 1957. Orchard Lake St. Mary’s H.S. June 1961.
i was born and raised in Hamtramck beginning January 1950. I welcome contact (see email) from anyone having memories/stories similar to this article to discuss. This morning my brother in Michigan sent me your wonderful article on St. Florian’s. Well done! I attended St. Florian’s from 1st grade1955 till graduation in 1967. Thank you for writing about beautiful St. Florian’s. I lived on Faber St. In Hamtramck and I heard every time the church bells rang out. Joyous sounds as well as the sad sounds of funerals. Your adescriptions of the funerals was spot on. I attended many family funerals there, my grandparents, aunts, uncles and my parents. My mom Celia was in the first communicants class of St. Florian’s . My parents we wed there as well as my self in 1968. You took me back to magnificent St. Florian’s. I remember Monsignor Walkowiak, Fr.O and the others. 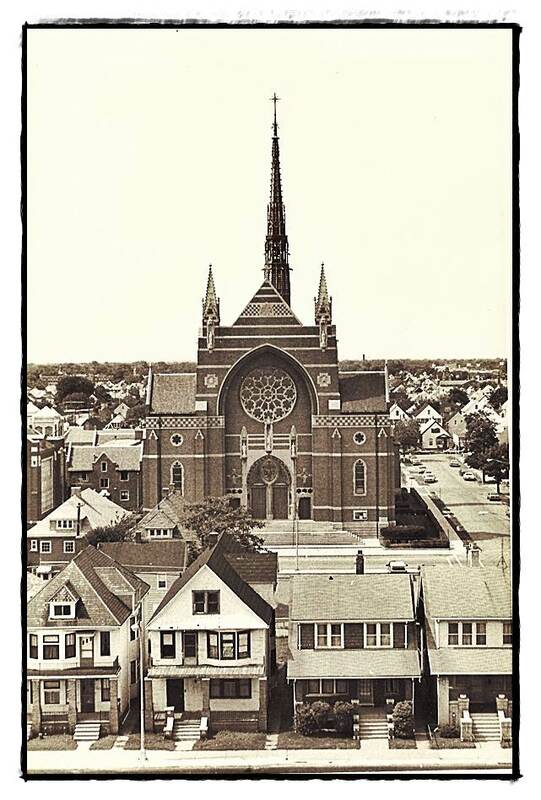 We were fortunate to have grown up and lived in such a wonderful city as Hamtramck and belonged to St. Florian’s. I reside in Ft. Lauderdale and Connecticut now. I look forward to reading more of your work. My dad, Billy Muszynski was born in Hamtramck. I have a wedding ring box from 1943 from Max’x Jeweler. My grandparents, both sets, lived on Moran St not far from Hamtramck. Fr Oleksyk was my uncle. He bought me my first bike. I enjoyed this story. Excellent article. I was told Msgr. Walkowiak insisted on a limousine because of a previous funeral procession, where a private person drove the car for the priest and altar servers. He was involved in an accident and the parents of the altar boy sued the parish, so from then on the rule changed. I did go to St. Florian from 1942 through 1954. Were married there and had our first child baptized there. The greatest memories are living in Hamtramck and the life long friendships. Loved the article, very interesting ! I also lived in Hamtramck during it’s heyday. It was a beautiful city, St Florian Church and School will always remain in my memory. It is a blessing that some of us from the class of 1954, still get together, and of course we pray for and remember our deceased classmates. I was married at St Florian and I did consider it an honor!